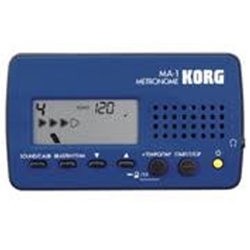 The Korg MA-1B is a compact metronome that solidly covers all the basics with a broad tempo range and a rich variety of beats and rhythm patterns. The MA-1B also shows the beat in an innovative way that makes practicing easier. The MA-1B is available in your choice of two-tone color schemes: Blue and Black, or Black and Red. With stylish design and reliable functionality, this is an indispensible rhythm training aide for any musician.